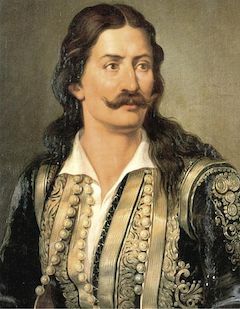 Though he acquired his nickname Diakos (“deacon”) from a youthful spell in a monastery, this fellow Athanasios (English Wikipedia entry | Greek) while the Turks still governed Greece made his way as a klepht — Greece’s version of the Balkan hybrid outlaw/guerrilla archetype, similar to the hajduk figures among the South Slavs. All of these outlaw types took to the mountains where they could subsist as brigands and mercenaries beyond the reach of the Porte, and seek opportunities where they might to strike at Ottomans. Many of the Greek persuasion, Diakos included, adhered to the Filiki Eteria secret society that aspired to liberate Greece. With the onset of the Greek War of Independence in early 1821, Diakos jumped right into the fight. Picturesquely, he met a much larger Turkish detachment in battle at Thermopylae where he made like Leonidas and with a handful of companions heroically held out against impossible odds at the Alamana Bridge. 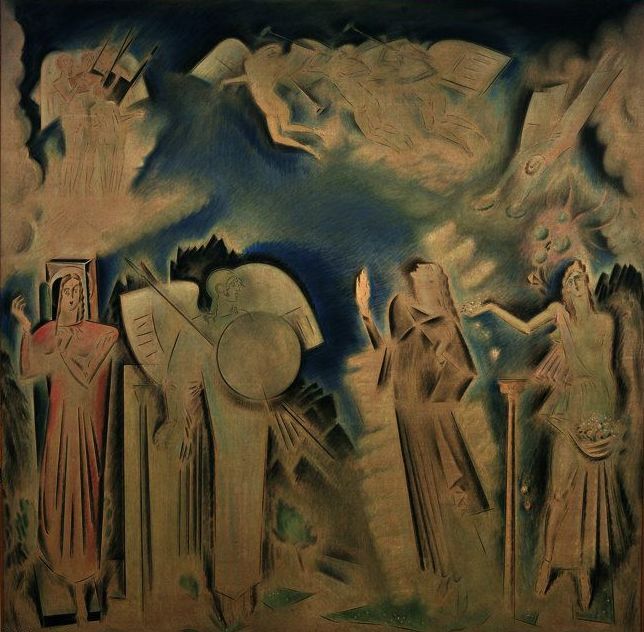 The Apotheosis of Athanasios Diakos, by Konstantinos Parthenis (1933). He’s a very famous and beloved figure in Greece, albeit much less so in parts beyond. The village where Diakos was allegedly born has been renamed for him full stop. * The narratives I’ve seen run a bit hinkie between the Battle of Alamana on April 22 and the great klepht’s death on April 24 since there’s a two-day gap and everyone seems to agree that he was ordered for execution “the next day”. I’m sticking to the agreed death date here, which is universal, but as best I can discern the timeline alternatives for accounting the missing day appear to break down between the notion that Diakos was impaled on the 23rd and lingered on his spike overnight before death, and that it was not until the 23rd that the Ottoman commander had the opportunity to interrogate him and decide his fate and thus “the next day” was the 24th. I haven’t located a source that appears dispositive on this issue. Vicente Guerrero, late the president of Mexico, was executed on this date in 1831. 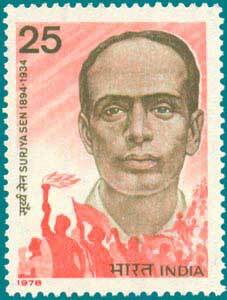 He was once a rebel soldier under Jose Maria Morelos in the Mexican War of Independence against Spain. 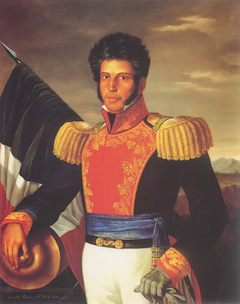 The Afro-Mestizo Guerrero (English Wikipedia entry | Spanish) cinched that conflict by successfully appealing to his royalist opposite number, Agustin de Iturbide, to switch sides. Their combined forces rode into Mexico City together in September 1821 but the conservative Iturbide and the liberal Guerrero soon parted ways. Iturbide was elevated to emperor of Mexico; Guerrero by 1823 had returned to the field to rebel against the strongman. 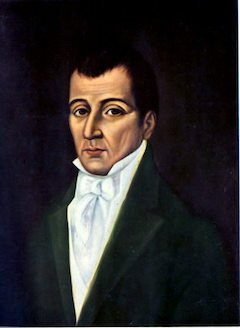 When Iturbide was deposed (and eventually executed), Guerrero became one of the ruling triumvirs and a national political figure. 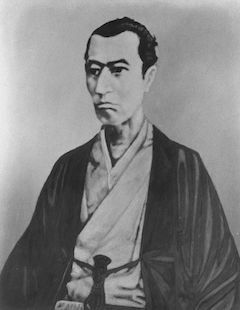 He contested the 19281828 presidential election which he lost at the ballot box but won in the ensuing street battles — an affair that featured the intervention on Guerrero’s side of Santa Anna. He was quick about abolishing slavery and he had to be, for this mixed-race populist was deposed by his conservative vice president within months — beginning another round of civil conflict that was dishonorably resolved when an Italian sea captain arranged with the Mexico City government to lure him aboard and arrest him. For this gambit Judas received 50,000 pesos and Guerrero a summary court-martial and a firing squad at Cuilapam. The southern Mexico state of Guerrero is named for him; its slogan, mi patria es primero (my fatherland is first) is the legendary reply that the young Vicente Guerrero made to his Spain-supporting father when asked to foreswear the independence movement. It was perhaps around the winter outset of 546 BCE that the Lydian king Croesus was captured and executed or spared by the Persians. Famed for his wealth — he funded the construction of the Temple of Artemis, one of the Seven Wonders* — Croesus was heir to a 600-year-old empire dominating western Anatolia. Herodotus credits the Lydians as the inventors of coinage, a likely basis for the “rich as Croesus” expression. 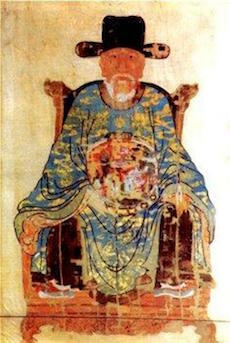 Would that he had been so rich in wisdom. In perhaps 547 BCE, Croesus launched a war against the rising power on his eastern border — the Persian Achaemenid Empire, led by Cyrus the Great. In a classic ancient own-goal, Croesus got the thumbs-up for this adventure from the Oracle of Delphi, who told the Lydian envoys that if Croesus fought Persia, he would destroy a great empire. ** That empire turned out be his own. After fighting to a stalemate in the autumn of 547, Croesus retired to his capital of Sardis to winter, believing war would abate with the end of the campaigning season — even dismissing his allies until the spring. Cyrus surprised him instead, marching aggressively on Sardis and putting it to siege after routing a much larger Lydian army at the Battle of Thymbra.† It wasn’t long before the Persians found an ill-defended entrance into the city’s citadel via a mountain ascent, and fulfilled the Pythian priestess’s prophecy. The Persians gained Sardis and took Croesus prisoner. Croesus had ruled fourteen years and been besieged fourteen days. Fulfilling the oracle, he had destroyed his own great empire. The Persians took him and brought him to Cyrus, who erected a pyre and mounted Croesus atop it, bound in chains, with twice seven sons of the Lydians beside him. Cyrus may have intended to sacrifice him as a victory-offering to some god, or he may have wished to fulfill a vow, or perhaps he had heard that Croesus was pious and put him atop the pyre to find out if some divinity would deliver him from being burned alive. So Cyrus did this. As Croesus stood on the pyre, even though he was in such a wretched position it occurred to him that Solon had spoken with god’s help when he had said that no one among the living is fortunate. When this occurred to him, he heaved a deep sigh and groaned aloud after long silence, calling out three times the name “Solon.” Cyrus heard and ordered the interpreters to ask Croesus who he was invoking … He explained that first Solon the Athenian had come and seen all his fortune and spoken as if he despised it. Now everything had turned out for him as Solon had said, speaking no more of him than of every human being, especially those who think themselves fortunate. While Croesus was relating all this, the pyre had been lit and the edges were on fire. When Cyrus heard from the interpreters what Croesus said, he relented and considered that he, a human being, was burning alive another human being, one his equal in good fortune. In addition, he feared retribution, reflecting how there is nothing stable in human affairs. He ordered that the blazing fire be extinguished as quickly as possible, and that Croesus and those with him be taken down, but despite their efforts they could not master the fire. Then the Lydians say that Croesus understood Cyrus’ change of heart, and when he saw everyone trying to extinguish the fire but unable to check it, he invoked Apollo, crying out that if Apollo had ever been given any pleasing gift by him, let him offer help and deliver him from the present evil. Thus he in tears invoked the god, and suddenly out of a clear and windless sky clouds gathered, a storm broke, and it rained violently, extinguishing the pyre. … or it is or is not successfully extinguished. A post-pyre Croesus then goes on to become a dutiful slave of Cyrus, the relationship of conquered and conquering kings full of aphorism and fable-ready vignettes with no dependable historical warrant. * For the pedants in the room, the “Seven Wonders” roster was composed later in antiquity, and the Temple of Artemis made the list based on its rebuild version after the one put up by Croesus had been torched by the fame-seeking Herostratus. ** Croesus rated the Delphic oracle’s advice highly. Aesop, the fable guy got himself executed by the Delphians by misbehaving while in the course of delivering a tribute from Croesus. † Allegedly, the unnerving sight of Cyrus’s camels arrayed for battle panicked the Lydian cavalry into flight.